Critical Mask | Part Goggles. Part Camera. All... Kinda Cool. Part Goggles. Part Camera. All... Kinda Cool. Don’t drink the water. Don’t swim against the tide. Sharks like bright colors. All things they told you when learning how to swim. But not once did they explain how to film a documentary on mermaids. 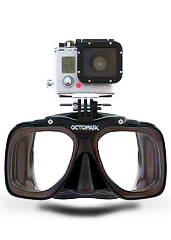 Have an Octomask, really just a pair of goggles with a tiny camera holster so you can dive hands-free while still recording everything you see (cameras recording things: who knew), available online now. The concept here: similar to a Bluetooth headset. Put this little device on your head. Look a little bit stupider than before. Go about your business. Only instead of looking like you’re talking to yourself at Kroger, you’ll be videotaping your snorkeling trip (clownfish don’t judge). Then just lock it in, press record and start swimming. Or hot-tubbing. Wherever needs filming, really.